I’ve never worked with chocolate before. I thought you needed a double boiler and all this special equipment while watching it like a hawk to make sure everything was going well. Of course, my whole conception of chocolate changed the more I learned at CK. For example, confectionery coating (the kind that looks like little discs) can be melted in the microwave and then used with molds and viola! Easy right? So, as a first-time chocolate user, I wanted to do it the simplest way. So I picked some confectionery coating and made sure I found the simplest mold that I could. Going through our catalog I found the Talking Candy Bar section, and I was intrigued! It looked so incredibly easy, I thought there might have to be a catch. All you had to do was melt some coating (maybe it was here that was the tricky part), pour it into the mold (maybe here? ), and then let set to harden. Simple, right? So I tried it myself to see just how simple it was. First, I had to grab some confectionery coating. If you get our weekly email (on Wednesdays) then you know that Peter’s Coating Icecap White (71-1200) were on Discount Corner last week. So I grabbed some of those and went to work. I wanted a Talking Candy Bar that could be versatile. One that I could use for any occasion, so I picked the one that said, “Thank you” (88-012319). One trick that I learned was you can use decorating bags to melt confectionery coating! Honestly, does it get much easier than that? So I filled a CK 12″ decorating bag (31-55) with the white confectionery coating discs and put it in the microwave. Now here’s the important part! You’ll want to microwave it at 40% power in 20-second intervals. Depending on how your microwave works will determine how many times you’ll have to repeat it. Mine’s pretty old so I did it 4 times. Make sure you take it out each time and knead it, so it mixes all together. Since there’s a larger area on the top that’s where it will melt first. Knead it well each time so that you get an even melt. Next is the fun part! Fill your talking candy bars! Snip off the end of your decorating bag and fill the mold. Seriously it’s the simplest thing I’ve ever done. Fill it almost all the way full (leave just a little room on the top for the coating to set), tap the bar on the counter so you get rid of the air bubbles, and let it set on the counter or, if you’re impatient like I am, stick it in the freezer for about 10-15 minutes. Once it’s completely set, fold the sides in, then the top, then slip the bottom flap into the slot and you’re complete! One cool thing about the Talking Candy Bars is that they have slots in the back for a business card or a small note. So it’s perfect if you own your own business and want to get your name out there. 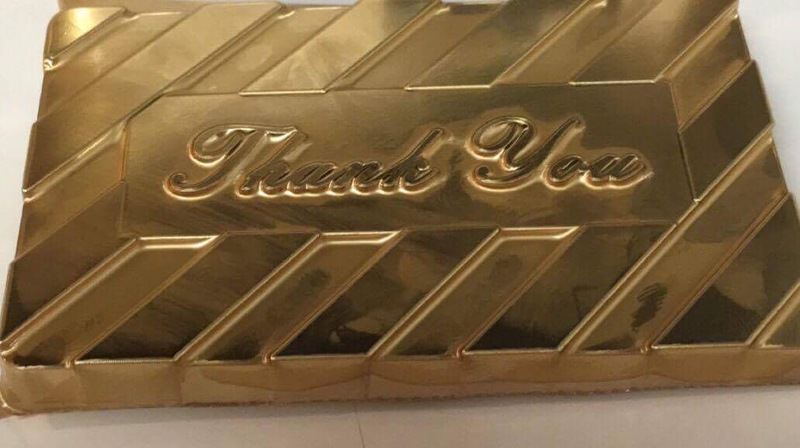 People might not remember you if you have just a plain thank you card, but if you give them a thank you card that is actually CHOCOLATE you’re sure to turn some heads. More Scrumptious treats coming up! 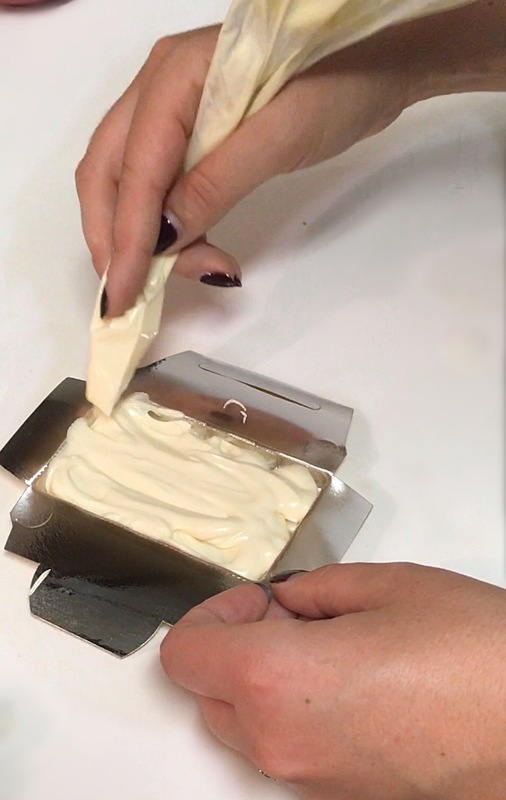 Once it is melted, snip off the tip of the decorating bag. One at a time, fill Talking Candy Bar mold with melted coating. Do not overfill! Tap the bar to get rid of all the air bubbles. Let set until it hardens, or put in the freezer for about 10-15 minutes to speed up the process. Fold in sides, then top and bottom of Talk Candy Bar. Close by inserting tab into slot. Corner slots may be used to insert a business or small greeting card. Top 10 ways to Celebrate Fall!